Elastic bandages were the first Tetra product and they continue to account for fifty percent of our sales. The consistent quality and trend setting styles keep our bandages in the forefront. 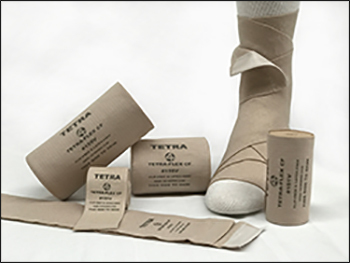 From the top of the line TETRA-FLEX bandages to the most economical style, the quality and the performance satisfy even the most particular customers. All of our elastic bandages are Latex free. This is our finest quality, top of the line, heavy duty woven latex free elastic bandage. The 0151 is now CLIP FREE with our new self closure system, making it easy to adjust and eliminate the need for clips or tape. Manufactured from a premium weave of spandex and selected long staple cotton with uniform compression throughout its construction. This bandage is especially suited for prosthetic applications, physical therapy, sports medicine and rehabilitation. The high cotton content allows for repeated use and washings. Available in 2", 3", 4" and 6" widths with a 5 1/2 yard stretched length. Each bandage is individually wrapped, one dozen per dispenser box. Sterile and extra lengths available. This is a high quality, medium weight, premium woven cotton/spandex elastic bandage. 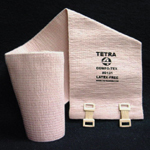 Comfo- Tex is an excellent all purpose bandage for general hospital and professional use. It provides sustained, controlled compression and stability by using a high percentage of cotton yarns. The bandage is washable and reusable. Available in 2”, 3”, 4” and 6” widths in 5 yard stretched lengths. Individually wrapped with stretch clips, one dozen per dispenser box. Latex-free. See Chart for STERILE and extra lengths available. This is an economical, lighter weight woven elastic bandage. Reinforced spandex with a blend of cotton and polyester. Excellent bandage for compression and support. It readily conforms to the anatomy and is soft and comfortable to wear due to a high percentage of cotton yarns. Available in standard widths of 2”, 3”, 4” and 6” in 4 1/2 yard stretched length. Individually wrapped with stretch clips, 10 rolls per dispenser box. Latex-free. See Chart for STERILE. A medium weight, reinforced spandex, polyester knitted bandage priced effectively for general use applications. Easily conforms to the anatomy for support and compression. This bandage is cool and comfortable to wear. The G611 is a full 5 yard stretched bandage, the extra length bandage, G515, is a 10 yard stretched length and the G645 bandage is a very versatile 4 1/2 yard stretched length. Each bandage is individually wrapped with aluminum clips. All are latex free. Sold in 2”, 3”, 4” and 6” widths, one dozen per dispenser box. The extra length bandage. See chart for STERILE and extra lengths available. A premium, medium weight, reinforced spandex, polyester knitted bandage with a unique plush side for extra padding and comfort. Excellent all purpose utility bandage for support or compression. Available in 2”, 3”, 4” and 6” widths in 5 yard stretched lengths. Individually wrapped with stretch clips, one dozen per dispenser box. Latex-free. This premium bandage is washable and reusable. Not available in sterile form. The Hook Lock is our finest quality knitted elastic bandage. The unique loop lock design is manufactured with a blend of cotton and polyester yarns. This allows for secure adherence and can be easily removed. The Hook Lock utilizes hook fasteners at both ends to secure the bandage after wrapping. The front closure secures the bandage in place and the end closure eliminates the need for tape or clips. Available in 2”, 3”, 4”, and 6” widths with a 5 yard stretched length. Each roll is individually wrapped with 10 rolls per dispenser box. Hook Lock is washable and reusable. Latex-free. See Chart for STERILE and extra lengths available. Velclose is a high quality, medium weight, single hook self closure knitted elastic bandage. Our most popular, and best valued “clip free” elastic bandage. This bandage has great functionality and includes a printed “this side to skin” label for ease of use. Manufactured with a blend of cotton and polyester yarns, with reinforced spandex. Velclose is washable and reusable. Available in 2”, 3”, 4” and 6” widths with a 5 yard stretched length. Each bandage roll is individually wrapped with 10 rolls per dispenser box. Latex-free. See Chart for STERILE and extra lengths available.